If you love museums, there is nothing quite like South Kensington. With the V&A, the Science Museum and the Natural History Museum all on one street, passing through a (decorative) looking glass and returning weeks later has never seemed more possible. This time, our expedition had one main goal - to see the Dinosaurs, but, as it was a beautiful sunny day, we began by enjoying one of London's lesser known child-friendly parks: the courtyard at the V&A. With a shallow large central pool which children are welcome to paddle in, lawns and a little cafe, it is a haven from the bustle of London. With toddlers in soggy (rapidly expanding), nappies and cute kids in sunhats wading around hand in hand, the courtyard harbours rather an appropriate fin de siecle air of jolity and festival. With lunch eaten and Culturebaby rested, we headed into the Natural History Museum. These corridors are so well trodden by me that there is possibly a Museum Mummy footprint to be found somewhere amongst the fossils, but with Culturebaby it provided a whole new and refreshing experience. When you know somewhere well, you often find you no longer look hard at it, and through toddlers eyes I saw the place again for the first time. The most surprising and welcome discovery was how much there was to touch and feel - so important for babies. We had entered through the Exhibition Road entrance, which has babychanging and a place to stow prams, but also provides a slightly quieter and more meandering route through to the dinosaurs. We stopped for a while in the Lasting Impressions Gallery. This great little area provides the opportunity for anyone to touch, feel and examine a range of impressive fossils. Culturebaby often gets frustrated when she sees something exciting and can't feel it. This area was perfect for her. She spent a while touching each item, and was also thoroughly interested in what her older buddies were doing. She always wants to play with what the older children play with and here she notably copied them as they examined the items. The 4 year olds also really responsed well to the invitation to work out the age of the Bezoar Goat from its horn ridges, count tree rings etc... calling to each other excitedly as they shared their discoveries with each other. At ten months, Culturebaby is clearer about what interests her, and I was delighted to find that as we stopped to wait for our friends she was touching and examining the beautifully modelled terracotta wall tiles of the museum over my shoulder. The NHM is stunningly designed to showcase natural flora and forna, both living and extinct, in its decoration and is an absolute work of art and architectural prowess in its own right. It was refreshing to stop and take the time to look at the museum building rather than just its contents. The dinosaurs were, as ever, very popular. We made our way (slowly) along the high walkway (accessible by lift), carried along by the perenial herd of other curious homo sapiens sapiens, past a number of suspended fossils and exciting animatronics (which really caught Culturebaby's attention), towards the eternally appealing large T-Rex. I have it on good authority that the 'creature' is programmed to respond to the colour red. I have no idea whether the source was pulling my leg, but shuffling along behind our friend's bright red pram, I was very proud of my little explorer as she watched the animatronic model roar towards her without flinching, and babbled away at it with a smile on her face. (NB. For the less adventurous, there is a route round avoiding this particular room.) I've been round this whole section of the museum a number of times, but on this occasion I was really struck by how appealing it was for the children. Of course kids on the whole love dinosaurs, but this wasn't just a room of fossils and models, it also had screens recreating past environments, questions to consider, cartoons to bring the science to life, and most excitingly for us, LOTS to touch and feel. Culturebaby loved the range of textures and shapes of skin, teeth, scales and bones that she was invited to maul. We treated ourselves to a couple of models in the well stocked shop to remember our first encounter with the Cretaceous. Parental geeks beware. The shop has THE best selection of children's science and nature books you could ever hope to buy. Humanity may have missed the dinosaurs by a few million years, but here they present a real danger to the wallet. Ths is a lovely post - I live in London and haven't taken my 2 little ones (3 and 1) to the museums yet so it's great to read about a good experience for children of a similar age. 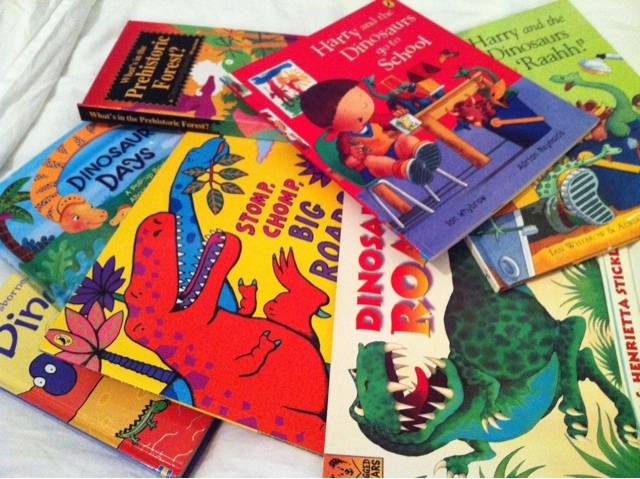 Love the dinosaur book recommendations as well! I really like the sound of Bumpus Jumpus Dinosaurumpus! Another one of our favourites is Dinosaurs Love Underpants!